: A self striping yarn paired with a solid color make fair isle knitting super simple with this free pattern from Classic Elite! 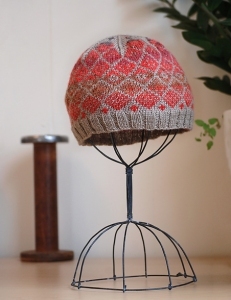 The DIY Fair Isle hat takes just two balls of yarn (oneof each color) and includes the pattern you see charted out, and a blank chart so that you can design your own if you want to get your creative juices flowing! This design is free from the Classic Elite website. Remember to download or print the pattern by following the link provided on this page, as it will not be shipped with the yarn. Size US 3 & 5- 16" circular needle and US 5 DPNs (or sizes needed to obtain gauge), and a stitch marker are required but not included. Gauge: 30 sts & 32 rnds over 4". Color shown: MC Liberty Wool Light - #6636 Taupe, CC Liberty Wool Print Light - #6663 Brick Road.